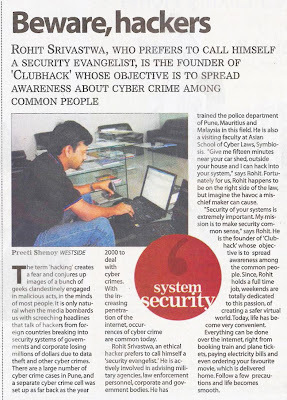 Thanks to Preeti for the interview which got published on 19th April 2008 in “Westside plus”. hey rohit–Really happy to see it and you deserve the coverage. 🙂 And thanks for the mention. Ps: Credit goes to you. Purvi: Thanks a lot dear. Good to see comment from a new friend. Hi, I was unable to read the whole interview. will have to try elsewhere, maybe the online edition of TOI? Raj: Click on the images to open them in big size. BTW this supplement is not available online. great stuff man! this is brilliant! all the best with clubhack!